Track all the latest news and updates about the upcoming Lok Sabha elections 2019 here. Amid cash-for-votes allegations, DMK leader Kanimozhi's Tuticorin house raided by I-T. Elections in East Tripura Lok Sabha constituency has been deferred from April 18 to April 23 owing to security reasons. Congress releases list of three names for Lok Sabha Elections 2019 , Acharya Pramod Krishnam to contest from Lucknow,Vinay Kumar Pandey from Kaiserganj (UP) and Pankaj Sanghvi from Indore (Madhya Pradesh). Elections LIVE: PM Modi addresses massive public rally in Bhubaneswar, Odisha. Odisha: PM Narendra Modi waves to people on his way to Baramunda ground, Bhubaneswar where is scheduled to address a rally shortly. HM Rajnath Singh on Poonam Sinha to contest against him from Lucknow as SP-BSP-RLD candidate: Yes somebody must contest, that is the beauty of democracy. We will fight elections with full dignity. Former Union Minister and senior Congress leader Dr Shakeel Ahmed on Tuesday filed nomination as a Congress party candidate from Madhubani Lok Sabha constituency. Shatrughan Sinha’s wife Poonam Sinha joined the Samajwadi Party on Tuesday. The party took to Twitter to make it official. The information was shared by the party’s official Twitter handle along with a photo of Dimple Yadav and Poonam Sinha. Samajwadi Party chief Akhilesh Yadav says that BJP is not coming back to power. BJP President Amit Shah holds a road show in Tumakuru, Karnataka. Amit Shah holds a roadshow in Karnataka's Tumkur. Mayawati's nephew Akash Anand makes debut at Mahagathbandhan rally in Agra. 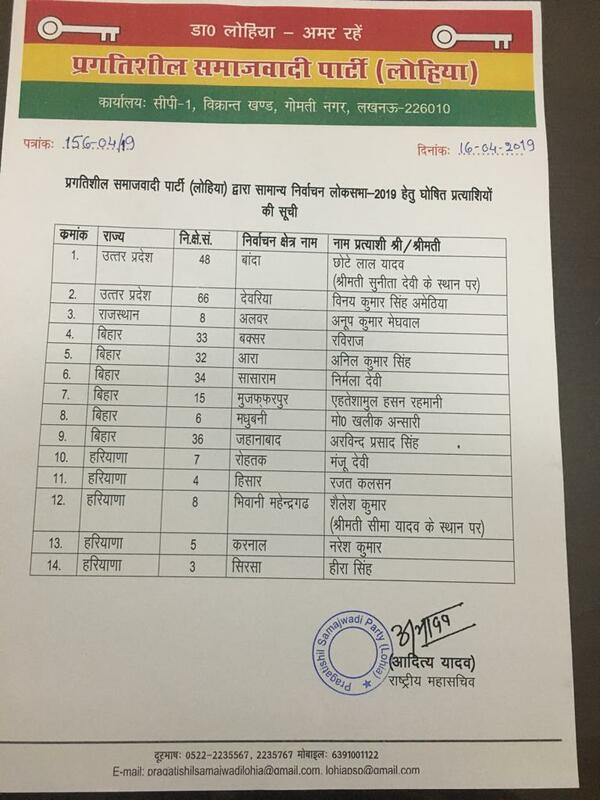 Shivpal Singh Yadav's Pragatisheel Samajwadi Party (Lohia) releases a list of 14 candidates for Lok Sabha elections in Uttar Pradesh, Rajasthan, Bihar and Haryana. Tamil Nadu Chief Electoral Officer: Rs 135.41 cr in cash has been seized in the state since imposition of Model Code of Conduct; liquor worth Rs 37.42 lakh; drugs&narcotics substances worth Rs 37.68 lakh; 1022 kg gold, 645 kg silver; precious metals worth Rs 294.38 cr also seized. A delegation comprising Congress' Sunil Jakhar and Tripat RS Bajwa and AAP's Harpal S Cheema and Nazar Singh met the Election Commission today requesting them to review transfer of IG, Kunwar Vijay Pratap Singh from the SIT probing sacrilege of Guru Granth Sahib and killing of 2 people in firing thereafter in 2015. Congress has been far removed from ground realities. The party doesn’t understand people’s sentiments, says PM Modi. Congress is not just protesting the Naxals but also promoting the ‘tukde tukde’ gang, says PM Modi. Congress has announced in its ‘dhakosla patra’ that it will end the sedition law, says PM Modi. Congress has turned Chhattisgarh into a safe haven for Naxals, alleges PM Modi during a poll rally in Korba. K'taka CM HD Kumaraswamy:It's because of me that contribution of Ambareesh is being given recognition&she(Independent MP candidate from Mandya Sumanlatha Ambareesh)goes around Mandya saying JDS is a party of thieves.I'm CM because of no other person but you(audience) 'punyaatmas'. Election Commission flying squad checks luggage of former Karnataka Chief Minister and BJP leader BS Yeddyurappa at helipad in Shivamogga, Karnataka. Karnataka: Election Commission flying squad checks luggage of former Karnataka Chief Minister and BJP leader BS Yeddyurappa at helipad in Shivamogga. Delhi: BJP delegation comprising senior leader Mukhtar Abbas Naqvi and Jagat Prakash Nadda, will approach the Election Commission later today against the ban on UP CM Yogi Adityanath who has been barred from election campaigning for 72 hours. Mumbai Lok Sabha poll: Rs 90 lakh cash seized in separate incidents. BJP may revive 'Operation Kamala' after Lok Sabha polls, but it will not succeed: Siddaramaiah. Rajasthan: Union Minister Rajyavardhan Singh Rathore files his nomination from Jaipur parliamentary constituency for Lok Sabha Elections 2019. Yoga guru Ramdev and Rathore's wife Gayatri Rathore are also present. For 20 years you trusted Odisha's government blindly but now the people of the state want change, says PM. Congress and 'Mahamilawati" group desperate to oust chowkidar because of BJP onslaught on corruption: PM Modi. Discrimination on the basis of caste and religion are only the achievements of Congress, BJD: PM Modi in Odisha. Government of Odisha against farmers: PM Modi in Sambalpur. There will be no middlemen, your money will directly come to you: PM Modi in Sambalpur. Prime Minister Narendra Modi in Sambalpur, Odisha: In such hot weather, such a huge crowd, such enthusiasm; pictures of these rallies are giving sleepless nights to others. People are supporting us because they want a strong government. Nation wants a strong PM, says Narendra Modi in Sambalpur. After freedom, a corrupt government was in rule: PM Modi. Earlier, only 15 paise of a rupee reached the poor, BJP ensured people get entire amount, he added. Earlier there was corruption in the country, but no one to fight it: PM Modi in Sambalpur. PM Narendra Modi is addressing a public meeting in Sambalpur, Odisha. Prakash Raj, who is contesting from Bengaluru Central Lok Sabha seat as an Independent candidate, says, "I'm not fighting against anyone. I'm fighting for the people. It's we who are the majority. In democracy,if you choose the right leader,people win,if you choose wrong leader,people lose." As PM said 'Congress mukt Bharat', meaning we'll erase idea of Congress from India.What Congress says to Narendra Modi is we don't agree with you.We'll fight you to convince you, you're wrong. We'll beat you in e election but we won't use violence against you, Rahul Gandhi. There is an ideological fight going on between the BJP and the Congress, says Rahul at an election rally in Pathanapuram. Because I wanted to give a message that India is not just one perspective, India is not just one idea, India is million & millions of different viewpoints, different perspectives and all of those are important to us, says Congress President Rahul Gandhi at Kollam in Kerala. No matter how many times you (BJP/RSS) attack us, we will use love and non violence to convince you are "wrong": Rahul Gandhi. Preparations underway for Lok Sabha elections in Ramanathapuram parliamentary constituency; District Collector says, "we are fully prepared to conduct free and fair elections." Tamil Nadu: DMK MP candidate from Chennai Central Lok Sabhathe constituency, Dayanidhi Maran, campaigns in the constituency. All 39 Lok Sabha seats in the state will go to polls on April 18. 4 railway employees have been suspended after tickets with photo of PM Modi printed on them were issued to passengers at Barabanki railway station on Tuesday. ADM says, "On 13 April, when shift changes, the old roll was mistakenly used. Besides two reservation clerks, one Chief Reservation Supervisor and a Commercial Inspector have also been suspended." No order issued for cancellation of Lok Sabha polls in Vellore: ECI. N Manjunath Prasad, Bruhat Bengaluru Mahanagara Palike commissioner and district election officer said that there is no fake voter ids. What we found is that survyes were done and people who even don't stay in a particular place but are registered in were given these voter slips thus making sure the polling percentage increases. This is was an initiative so that polling will be good. BJP chief Amit Shah will address rallies in Kerala and Karnataka. Congress president Rahul Gandhi will attend four election campaigns in Karela --- Thiruvananthapuram, Pathanamthitta, Pathanapuram and Alappuzha. Union Home Minister Rajnath Singh will file his nomination from Lucknow. Prime Minister Narendra Modi will hold a roadshow in Bhubaneswar during his visit to Odisha today. He will address two rallies in Bhubaneswar and Sambalpur.